When there is an echo present at the near end and the far-end echo canceller is a potential culprit, one of the questions to address during the diagnosing/debugging action is to determine what contributes the most to the echo presence in the given system configuration and acoustic scenario. Often, the exact system configuration (in term of detailed blocks, interconnections and software functionality) is not known upfront and, therefore, it is helpful if simple tests are done to determine potential culprit(s) contributing to the presence of echo. Let us consider one of specific system configurations, as seen from the high level view, where at both ends of the network connections there is loudspeaker and microphone. Let us also assume that details pertaining to the network configuration are hidden and the engineer leading the diagnostic effort does have access only to the front-end of the near-end and far-end locations access. An example the system configuration (as seen from high-level view) is depicted in Figure 1. At the NE (Near End) there is echo present (talker echo). Is the acoustic echo canceller or the line echo canceller (or both echo cancellers) contributing to the presence of the talker echo observed at the near end? 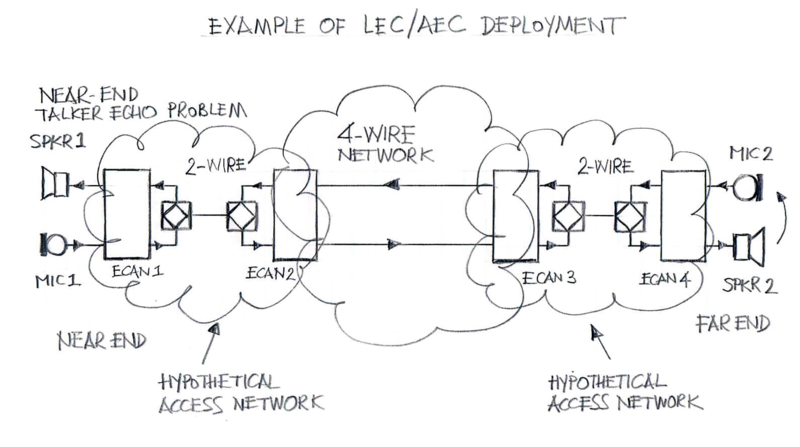 In order to prepare for answering the above question, let us represent the actual network system is a slightly simplified fashion in order to concentrate onto one of the probable areas that can potentially contribute to the echo problem (refer to Figure 2 for details). Figure 2: High-level view of the network system under consideration showing only elements that are essential to the problem at hand. In Figure 2 we show only two possible ECANs that, if present, could contribute to the echo problem: ECAN 3 (potentially present and active) and ECAN4 (also potentially present and active). ECAN3 is definitely supposed to cancel the line echo and, if designed for acoustic echo cancellation too, it should also cancel ECHO 4. The main purpose of the diagnostic procedure (outlined below) is to answer the posed question about which of these two echo cancellers contributes to the echo problem. Step 1: collect audio streams under single talk conditions (i.e., when NE talks) while the MIC 2 is not occluded (normal condition), meaning that when both MIC2 and SPKR2 are acoustically coupled (via direct acoustical coupling and through possible acoustic reflections at the far end acoustic environment). Step 2: collect audio streams under single talk conditions (i.e., when NE talks) when MIC 2 is occluded (test condition). NOTE: the purpose of occluding MIC2 (in Step 2) is to break the echo path delay (i.e., to remove ECHO 4). Some systems allow for just disconnecting (or otherwise disabling) the microphone (this is a preferred way, but not always practically possible; the microphone occlusion is never perfect and thus some acoustic leak may occur). The microphone setup change there (either by microphone occlusion or by disabling the microphone) contributes slightly to line echo (if there are segments of voice connection that are 2-wire connections). Step 1: Produce reference results. No diagnostics results are available at this step yet. 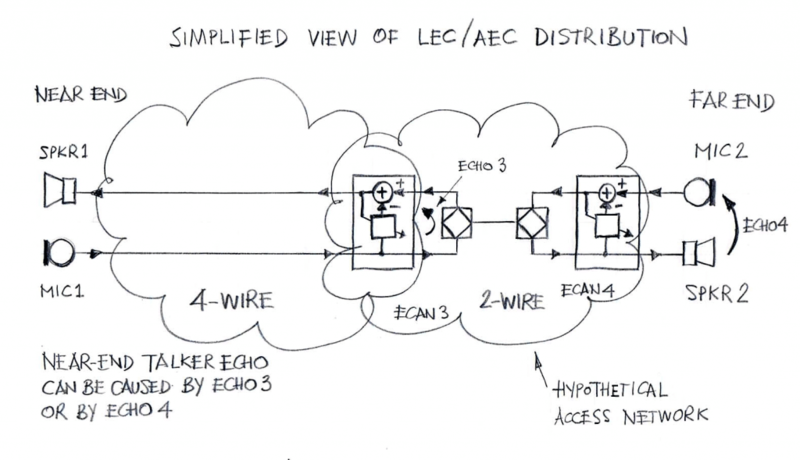 Possibility 3: the echo is still there but its level has decreased; conclusion: there is 2-wire connection active and ECAN 3 is somewhat functional (yet not performing to the full extend). The considerations above indicate that by analyzing audio files taken from the NE while occluding the microphone at the FE a great deal of information about potential contributors to the echo problem as well as about network connections and deployment of ECANs can be obtained. Please contact us to discuss your echo canceller application requirements.